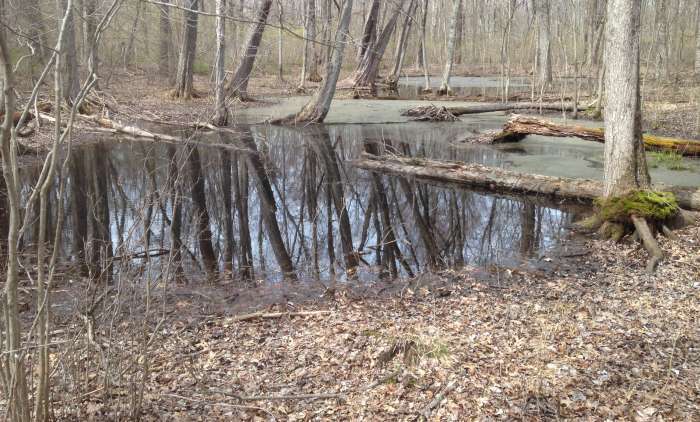 The Friends of Dyke Marsh invite you to learn about vernal pools, seasonal, ephemeral pools of water that provide habitat for distinctive plants and animals, including salamanders and frogs. Vernal pools occur throughout the Washington area and play an important role in the environment. Our speaker will be Karen Sheffield, the Park Manager at Huntley Meadows Park and Historic Huntley. Before joining the Fairfax County Park Authority in 1999 she worked for the National Park Service, the Audubon Naturalist Society, and the Loudoun County Parks and Recreation Department. In this program she will explain what a vernal pool is and discuss the animals and plants that inhabit these shallow pools of water. She will also share findings from an ongoing vernal pool survey program being conducted in Huntley Meadows Park. This program is cosponsored by the Friends of Huntley Meadows Park, the Friends of Mason Neck State Park, and the Friends of Accotink Creek. It is free and open to the public. FODM will host an informal social gathering at 1:30 p.m.